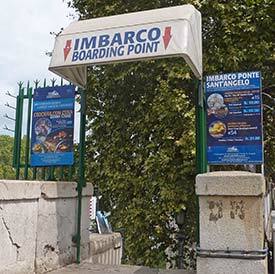 At the Ponte Sant'Angelo stop, across from the Castel Sant'Angelo, signs mark a staircase that leads from the street to the boat landing on the Tevere (a.k.a. the River Tiber). 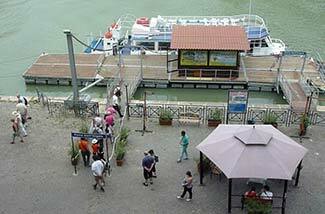 The Ponte Sant'Angelo landing has a ticket office, a floating dock for Battelli di Roma's sightseeing boats, and a shelter where passengers can find shade while waiting for their boat to arrive. Here's another view of the Stazione Ponte Sant'Angelo, which was taken from the Castel Sant'Angelo on the opposite side of the Tiber. 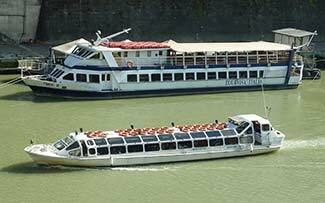 The double-deck boat in the photo is one of the larger vessels in the Battelli di Roma fleet, with a capacity of 102 passengers. 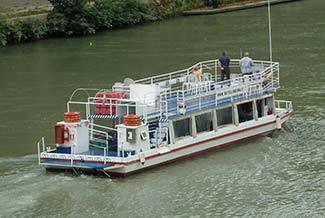 The 102-passenger Cornelia entered service in 1997. 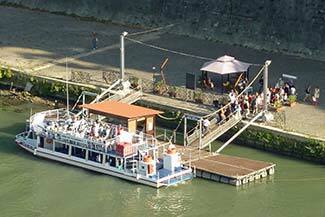 The Rea Silvia (shown in the foreground) is one of several Battelli di Roma vessels that offer "hop on, hop off" service at two landings on the Tevere. 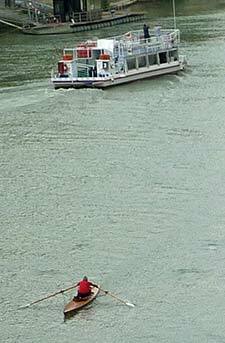 As you cruise along the Tiber, you may encounter kayaks, rowing shells, and other boats (including the occasional cargo or construction barge). 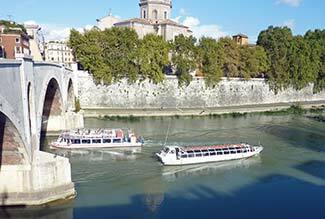 This photo shows two Battelli di Roma boats on the Tevere, with a bridge on the left and a high retaining wall behind the riverbank. A walkway runs along the water.